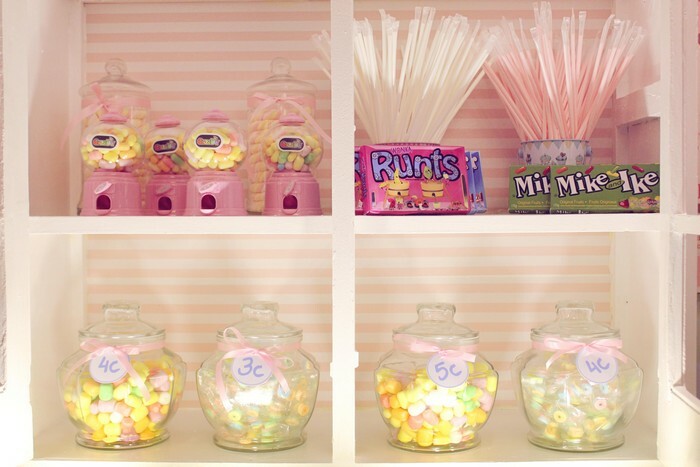 Isn’t that so cute and girly? 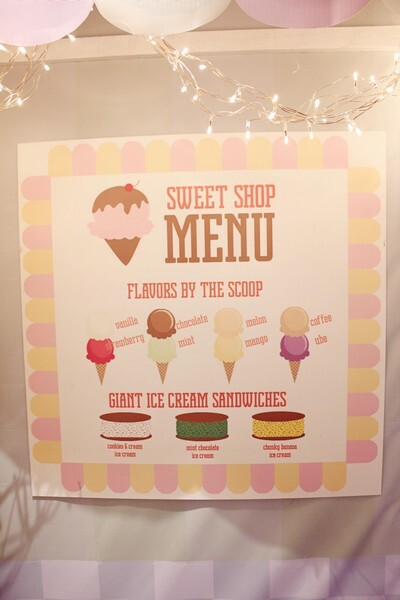 For the stage setup, we recreated a sort of “sweet shop” scene where we have an ice cream cart that carries the birthday cake and a sweets cupboard that holds actual candies! The more traditional way to display a cake is that a caterer sets up a round table, puts some table covers, and places the cake on top. More recently, I find that one of the best ways to display a birthday cake is to incorporate it within the whole scene that you are creating. 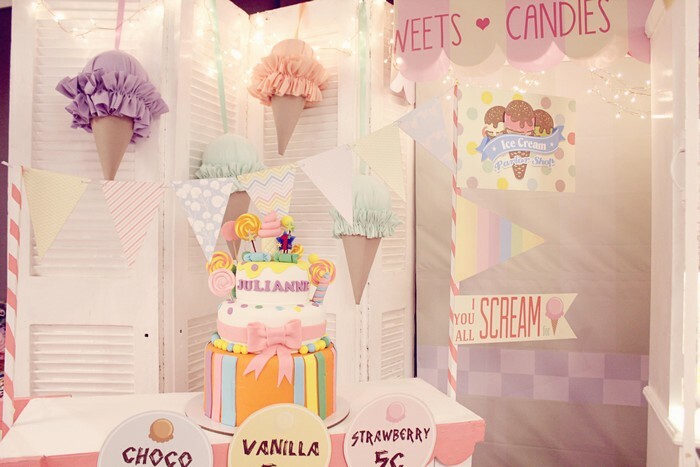 In this case, the best place to put the cake was on top of the ice cream cart, and boy did it look extra delish! 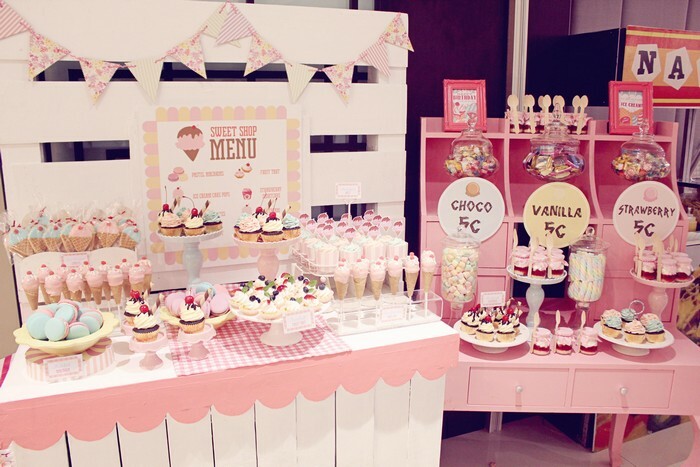 I love the idea of putting actual treats; in this way, your stage setup looks good, and you (and your guests) can eat it too! 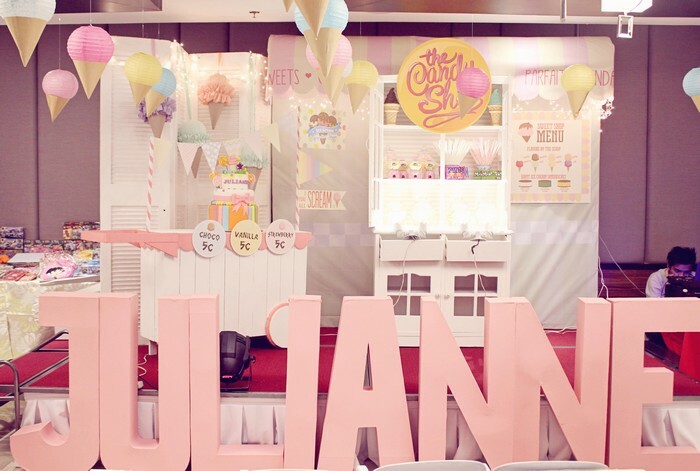 Above is a snapshot of a graphic we used for the party. 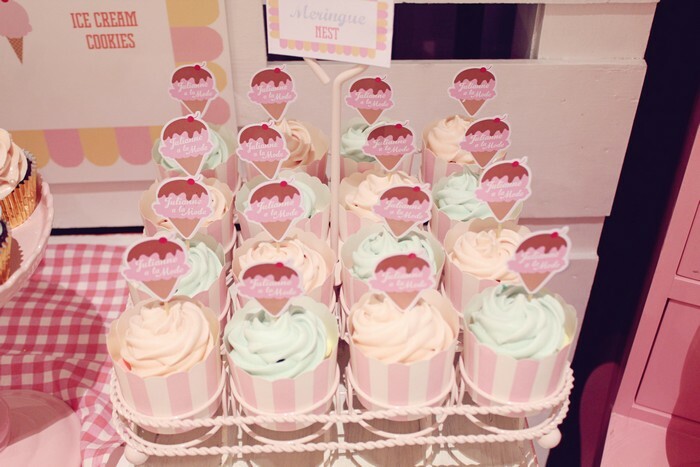 Too bad there weren’t any actual ice cream sandwiches at the party, those are my personal favorite! 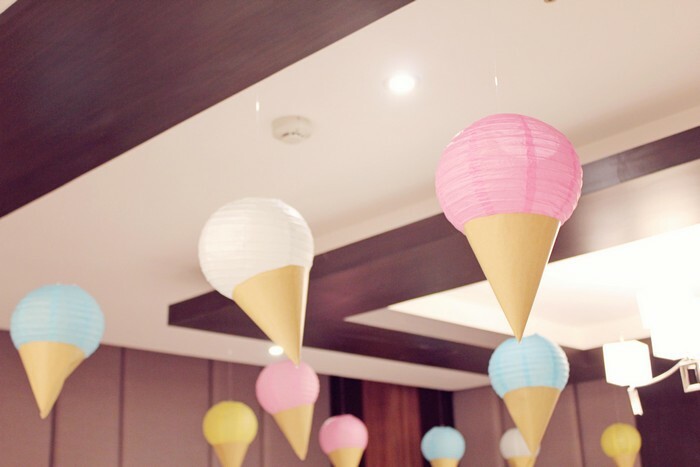 These are just actually small-sized pastel colored lanterns, with brown paper cones attached at the bottom. 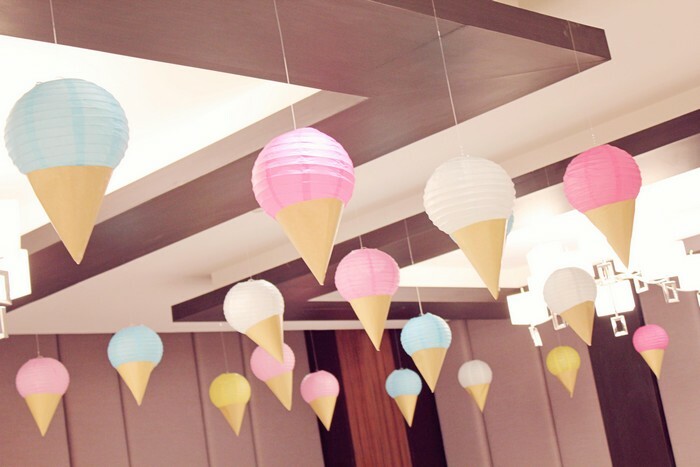 A simple yet ingenious twist to the usual ceiling treatment! 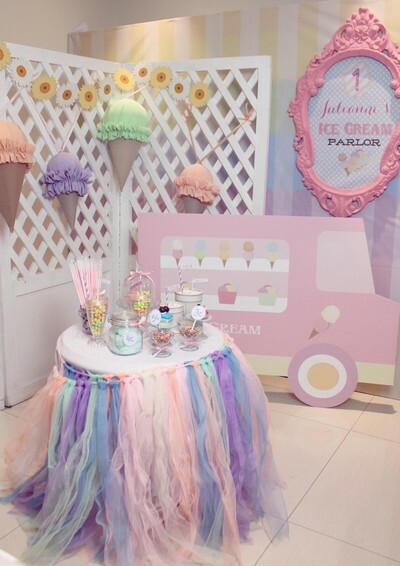 For the photo-op, we created a quaint little scenery filled with an ice cream truck, a divider, and a round table full of sweet delights! 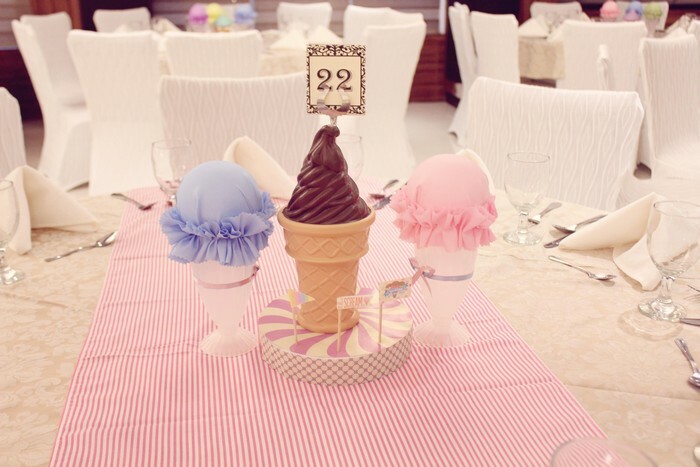 The centerpiece fell in step with the theme: ice creams and cupcakes! 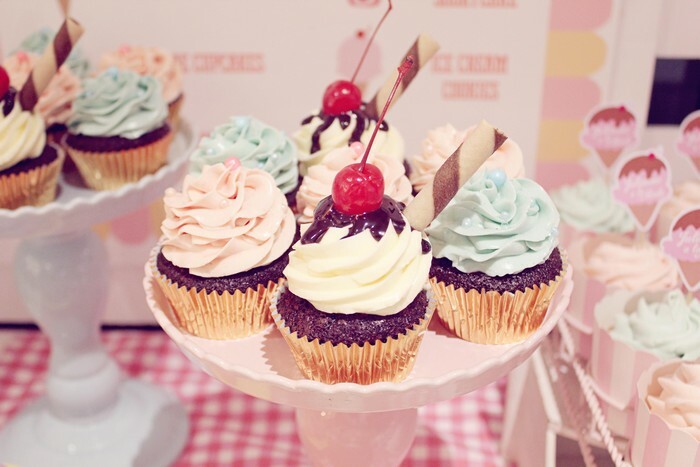 Let’s begin with my personal favorite: the Sundae Cupcake!! 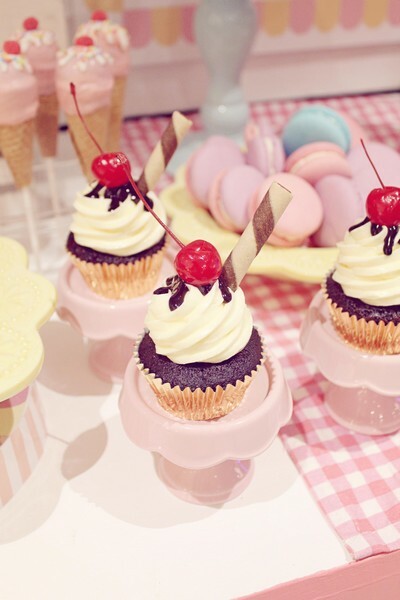 I think this was a wonderful twist to the usual cupcake. This particular creation was filled with Madagascar Vanilla Bean Cream, topped with Simply Paris’ signature chocolate sauce, cherry, and wafer stick! Suffice it to say that these were one of the first ones to run out of stock! My next favorite is the Meringue Nest. Look at those swirls! Perfectly in step with the theme. Simply Paris’ meringue are famous for its crunchy exterior but chewy insides! Let’s move on to more dessert goodness shall we? 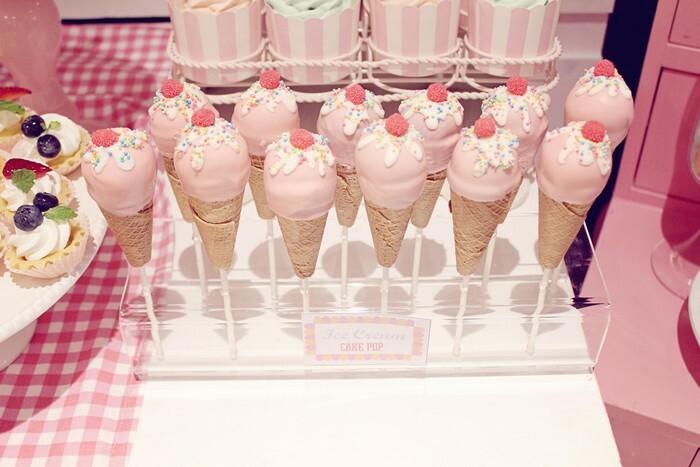 Ice cream cake pops. These I find to be very well designed and pleasing to the eye. Not only that, it is perfectly edible (and tastes good as well)! 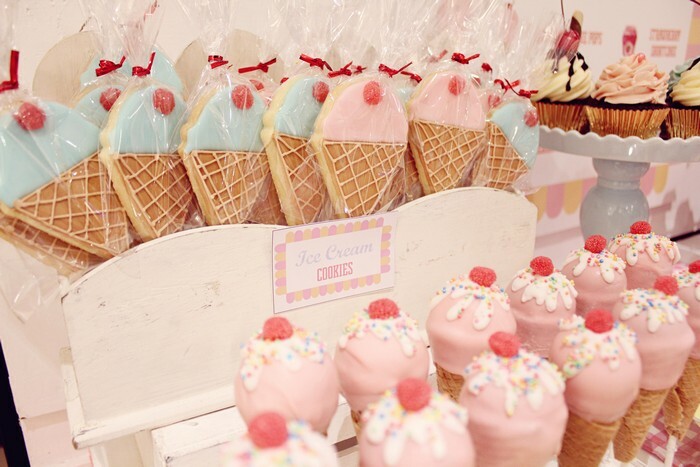 Ice cream cookies. Trust me when I say this. Those cookies are really really good! Not too sweet, with the just the right amount of icing. I know this because Nikki left an extra piece while baking and I tried it out for myself. Too bad it was just 1 piece, wouldn’t have hurt if there were more! 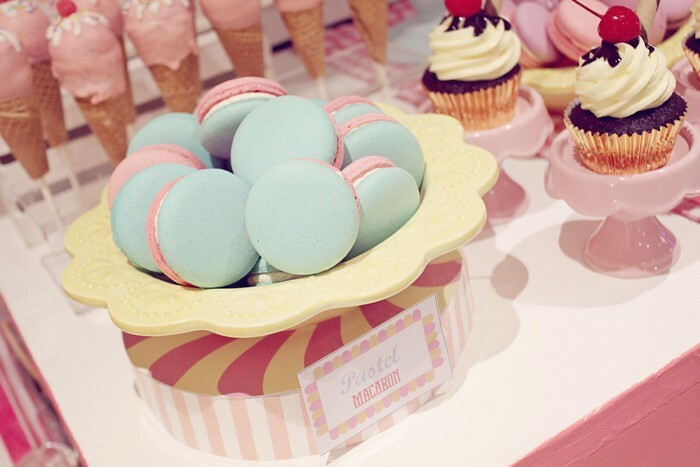 And of course, the whole party wouldn’t be complete without Simply Paris‘ signature dish: the Macaron. This time it came in two tones, pastel pink and blue! The pastries were a runaway success; I decided to drop by the party about an hour after it started and the dessert table was literally raided! People grabbed the desserts even before they started hitting the buffet table. Now that’s the best compliment you can tell a chef! hi Michelle…….I will be 50 years old next year August 1 to be exact……this may sound ridiculous but all I want for my birthday is a children party…..I’m thinking of sesame street theme party (I grew up watching it)…….with lots of colorful balloons and chocolates (I’m a chocoholic)…….why? I never had a party in my life…….so todo na to with at least 100 children from orphanage and selected probably 60 friends and relatives……..I also want a host and games for the kids……any recommendation where to order a cake and food caterer?…….I hardly open my email…….I check my fb all the time……can you pls reply thru fb message……..how is oasis as a venue? Or any recommendation? I don’t think it’s ridiculous at all. 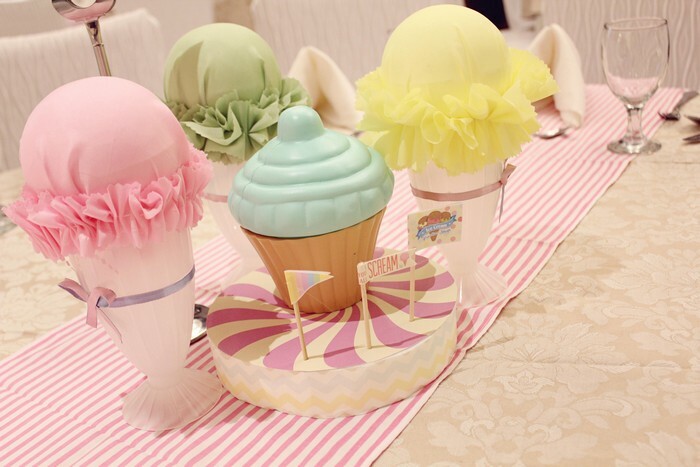 If it were just up to me, I would be celebrating my birthdays childrens-party style!